Elastography (EG) measures tissue stiffness noninvasively, which is classified into strain EG and shear-wave elastography (SWE). We reported the use of transabdominal ultrasonographic SWE to detect pancreatic fibrosis and chronic pancreatitis., EUS-EG was first reported by Giovannini using strain EG in 2006, and several studies have demonstrated its usefulness in pancreatic diseases. SWE is a method of obtaining quantitative data for tissue stiffness, and EUS equipped with SWE has been eagerly awaited. In this study, we first evaluated the feasibility of a newly developed EUS shear-wave measurement (EUS-SWM). EUS-SWM was performed using a GF-UCT260 linear-array echoendoscope (Olympus Co. Ltd., Tokyo, Japan) and an ARIETTA 850 ultrasound machine (Hitachi, Ltd., Tokyo, Japan). We measured tissue stiffness in the liver, pancreas, and intraperitoneal lesions by EUS-SWM in 42 patients who underwent EUS for the examination of pancreatobiliary diseases between December 2017 and January 2018. EUS-SWMs of the left lobe of the liver and pancreatic body and tail were performed through the stomach, and measurements of the pancreatic head were performed through duodenum. Measurements were performed during minimal respiratory fluctuation to avoid breathing artifacts whenever possible. A rectangular 5 mm × 10 mm Region of Interest (ROI) (height × width) was used in most cases and set at 5–10 mm below the EUS probe. ROIs were set excluding vessels, the bile duct, the pancreatic duct, and cystic lesions [Figure 1]. The success rate of EUS-SWM, the propagation velocity of the shear wave (Vs, m/s), and the reliability index of the Vs measurement (VsN) were evaluated. The Vs was displayed in meters per second or kilopascals through Young's modulus E = 3(Vs2ρ), where E is Young's modulus, Vs is the shear-wave velocity, and ρ is the tissue density, that is, stiffer tissue corresponds to faster shear-wave velocity. Figure 1: EUS-guided shear-wave measurement for pancreatic body Vs: velocity of the shear wave (m/s), VsN: reliability index of the Vs.
A total of 1102 EUS-SWMs were obtained in 42 patients, and no adverse events associated with EUS-SWM were observed. Overall, 96.8% (1067/1102) of the EUS-SWMs were obtained successfully. The median VsN was 63% (interquartile range [IQR]: 59). The Vs values for each of the measured locations were as follows: 1.86 m/s (IQR: 1.07) in the left lobe of the liver, 2.27 m/s (IQR: 1.52) in the head of the pancreas, 2.08 m/s (IQR: 1.59) in the body of the pancreas, and 2.20 m/s (IQR: 1.90) in the tail of the pancreas. Theoretically, strain EG just gives the relative stiffness within an ROI, not providing an absolute measurement of tissue stiffness. Therefore, till now, EUS-EG results have been examined qualitatively by pattern recognition methods and quantitatively by measuring, for example, the strain ratio and strain histogram., However, comparisons of strain EG between individuals are limited due to lack of both objectivity and methods of standardization. EUS-SWM made it possible to make immediate and repeated measurement of the objective elastic value with the unique reliability index (VsN). Our findings suggest that EUS-SWM may be a promising EUS technique for detecting various pancreatic and gastrointestinal diseases by quantifying tissue stiffness. Kuwahara T, Hirooka Y, Kawashima H, et al. Quantitative evaluation of pancreatic tumor fibrosis using shear wave elastography. Pancreatology 2016;16:1063-8. Kuwahara T, Hirooka Y, Kawashima H, et al. Usefulness of shear wave elastography as a quantitative diagnosis of chronic pancreatitis. J Gastroenterol Hepatol 2018;33:756-61. Giovannini M, Hookey LC, Bories E, et al. 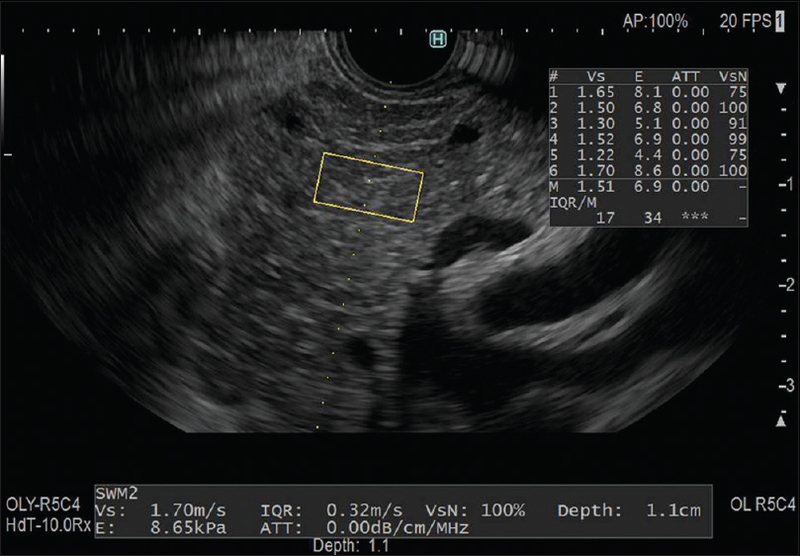 Endoscopic ultrasound elastography: The first step towards virtual biopsy? Preliminary results in 49 patients. Endoscopy 2006;38:344-8. Iglesias-Garcia J, Larino-Noia J, Abdulkader I, et al. Quantitative endoscopic ultrasound elastography: An accurate method for the differentiation of solid pancreatic masses. Gastroenterology 2010;139:1172-80. Itoh Y, Itoh A, Kawashima H, et al. Quantitative analysis of diagnosing pancreatic fibrosis using EUS-elastography (comparison with surgical specimens). J Gastroenterol 2014;49:1183-92.